As a food blogger, I am occasionally faced with the dilemma of being stumped on a name for a delicious recipe I have created to share with you all. About 95% of the time, the absolutely perfect name for a recipe comes to me before I have even finished researching and writing the actual recipe. This was not the case with these Bailey's Irish Kiss Brownie Thumbprints. I mean they are cookies, but they are made with a brownie mix. At first, I thought maybe I could name them brookies, but after chatting with a few food blogger friends it seems that the consensus is that a "brookie" is a cookie/brownie hybrid with two distinct components. I briefly entertained calling them crownies... for like two seconds. But that didn't sound right at all. Not only are these cookies made from a brownie mix, but they also happen to be thumbprints. Until I sat down to start editing the photos for this post, and then it dawned on me! These cookies are brownie thumbprints! 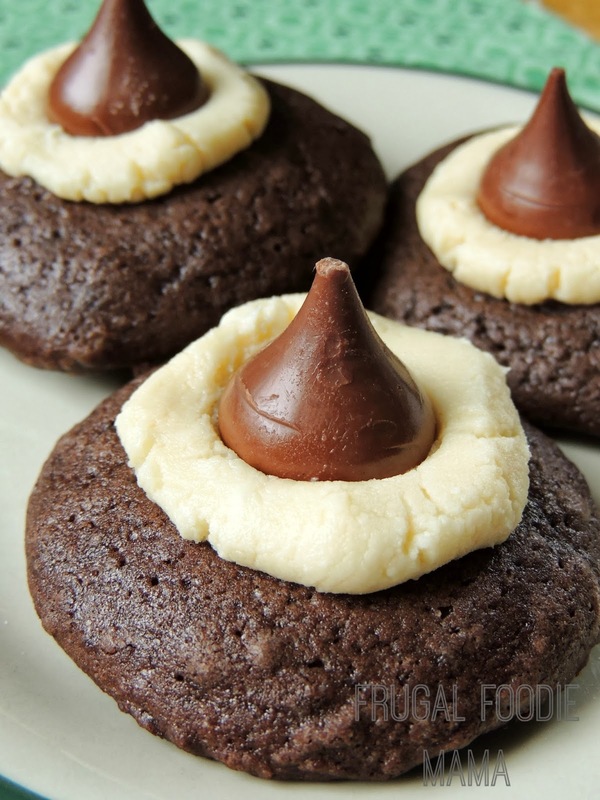 Thumbprints filled with a Bailey's Irish Cream spiked fudgy center & topped with a classic chocolate Hershey's Kiss! 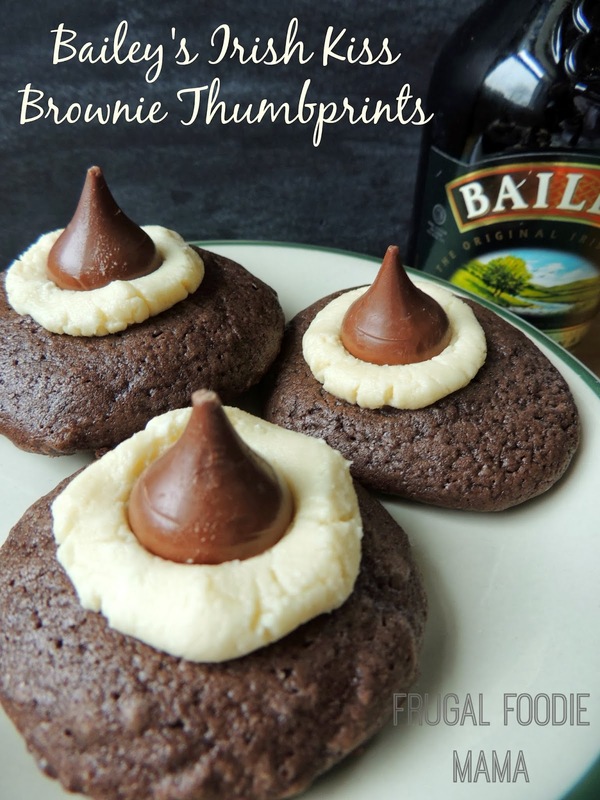 These Bailey's Irish Kiss Brownie Thumbprints are perfection, my friends. In a large mixing bowl, stir together the brownie mix, melted shortening, egg, chocolate syrup, & 2 tbsp of the Bailey's and mix until well combined. Roll the dough into about 1 1/2 tbsp balls. Place them at least 2 inches apart onto the prepared baking sheet. Bake for 10-12 minutes or until almost set. Remove from oven & let cool on the baking sheet for 1 minute. Then while the cookies are still warm and the centers are soft, press the back of a small spoon into the middle of the cookie creating an indentation or "thumbprint". Transfer the cookies to a wire rack and allow to cool completely. Unwrap all 20-22 of the chocolate kisses and set aside. You will need to have 1 kiss per cookie, so be sure to unwrap enough. Once cooled, melt the vanilla candy melts according to the package instructions. When melted, quickly whisk in the remaining 2 tbsp of Bailey's. The mixture will seize up slightly and get thick in consistency- that is okay. It should turn to a more fudgy consistency. Roll the fudgy mixture into 20-22 1 1/2 tsp balls. 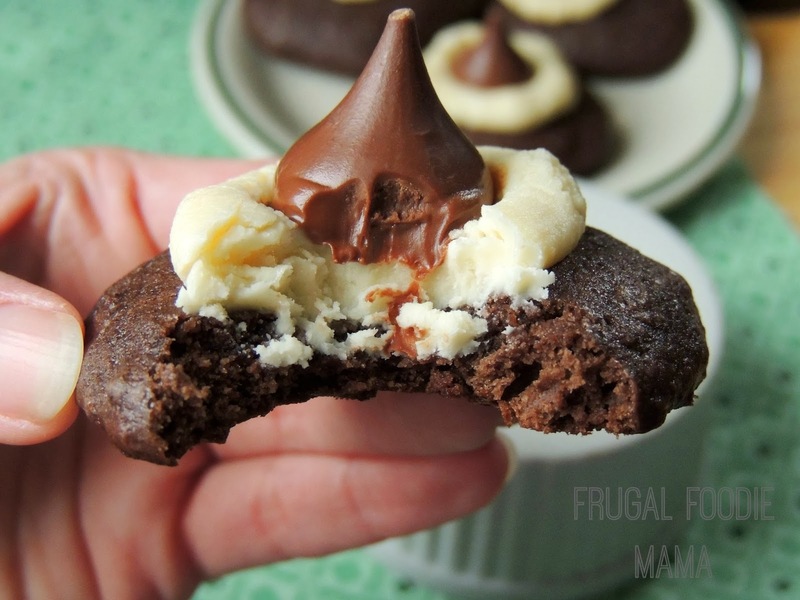 Press each fudgy Bailey's ball flat into the "thumbprint" in each cookie and immediately press a Hershey's kiss in the center of the flattened fudge ball. Continue this for each cookie.